CHARLOTTE, NORTH CAROLINA — In protest of Bank of America’s role in financing the planned liquefied natural gas (LNG) export facility in Cove Point, Maryland, activists from We Are Cove Point have suspended themselves from the upper deck of Bank of America Stadium during the Monday Night Football game between the Charlotte Panthers and the Indianapolis Colts. 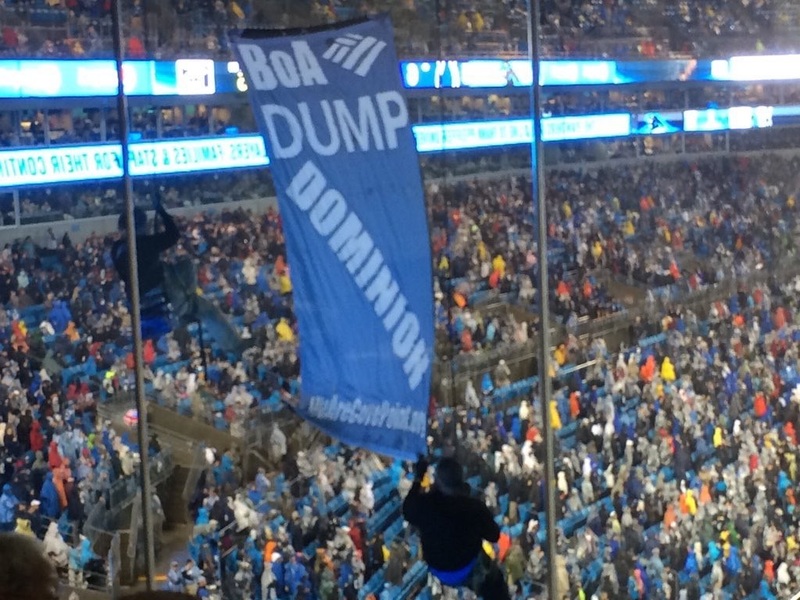 They dropped a banner that reads, “BoA: Dump Dominion, WeAreCovePoint.org,” that was seen by the stadium audience of more than 70,000 people. Bank of America (NYSE: BAC) has played a major role in financing Dominion Resources (NYSE: D) and its $3.8 billion LNG export facility at Cove Point through Dominion Midstream (NYSE: DM). Bank of America is part of a consortium of banks that is lending Dominion up to $4 billion to finance several planned gas infrastructure projects. In June 2013, Bank of America also underwrote $275 million to contribute to the capital expense of the Dominion Cove Point facility. We Are Cove Point activists are now calling on Bank of America and other lending institutions to stop financing Dominion. Dominion Cove Point is a proposed LNG export terminal that is slated to send up to 1.8 billion cubic feet of LNG to Japan and India. The facility would be the only one in the world to be built in a densely populated area, in violation of basic safety siting standards. It would drive demand for harmful fracking across the Mid-Atlantic, emit more than 20 tons of hazardous air pollutants each year, and spew two million tons of greenhouse gases, making it Maryland’s fourth-largest climate polluter. LNG exports are predicted to increase domestic gas prices, resulting in economic loss for every major sector of the US economy besides the gas industry, according to a Navigant Consulting report commissioned by Dominion Cove Point and a NERA economic consulting report commissioned by the U.S. Department of Energy. As more communities organize against the encroachment of gas infrastructure, Bank of America and other lending institutions are facing increasing pressure to stop financing dirty energy projects that negatively impact the lives and well-being of those living near export terminals, pipelines, compressor stations, fracking wells and gas-fired power plants. A broad, strong coalition of people has been actively resisting Dominion Cove Point at every step since the fall of 2013. We Are Cove Point is a leading part of the effort to stop Dominion Cove Point and reclaim the Cove Point community from Dominion’s grip. For more information, visit WeAreCovePoint.org and DumpDominion.org.